Sullivan County Manuscript Collection 0080. Richard family and Foust/Faust families. The collection was donated by Julie Elyce Powell of Bristol, VA.
Ruth Richard Powell Family Collection. MSS 0080, Archives and History Division, Sullivan County Department of Archives and Tourism, Blountville, Tennessee. This collection is comprised of items belonging to the family and ancestors of Ruth Richard Powell. The collection contains legal documents, newpaper clippings, genealogies, photographs, family Bibles and miscellaneous items dating from 1831 to the mid-1900s. Family surnames include, but are not limited to, Richard, Roe, Garrett, Foust/Faust, Beard, and others. 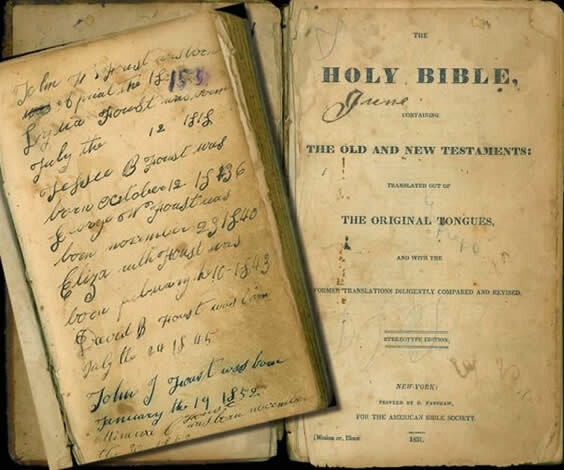 Of significant interest to the collection are the Bibles and genealogies which chronicle the early Foust/Faust families in Sullivan County, Tennessee and parts of Pennsylvania. Ruth Richard Powell was the daughter of Dea V. Richard (ca1893-1941) and Ida Lydia Faust (1895-1988) of Sullivan County, Tennessee. Dea V. Richard was the son of Samuel Richard and Gertrude Glover. Lydia was the daughter of William Kuhn Faust (1857-1925) and Elizabeth Ann Roe (1873-1957), and granddaughter of John N. Faust (1815-1899) and Lydia Beard (1818-1894). Newspaper clipping, undated, "A Remedy for Diptheria"
Newspaper clipping, undated, "Mrs. David Foust Honored on her 97th Birthday"
Genealogy, 1930, "First Fausts in Pennsylvania"
Genealogy, undated, "The Faust Family in the United States"
Photo, 1923, Clarence W. Barr, Jr.
Photo, 1921, Clarence W. Barr, Jr.
Photo, 1916, "Home at Weavers"
Photo, 1919, "Mary Sue and Dave Foust's children and in-laws"
Photo, 1917, "Foust home in Blountville just started"